For the last four years, with your help and contributions, PASALB have been proud sponsors of Curtis Nelson. Following his departure, we are looking to continue this tradition by sponsoring our manager, Derek Adams, and we very much hope you will support the club and help us reach our target of £945. As an incentive, everyone who contributes will be entered into a raffle with two prizes. 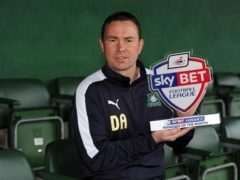 Prize 1: You and a guest to attend the sponsors lunch in Plymouth and sit at a table with Derek Adams. Prize 2: A unique signed and framed Derek Adams training top which we hope (but cannot promise this early) will be presented in person by Derek at our annual ‘Meet the Manager’ event in London. You will get one entry for every £10 contributed so the more you contribute, the more chance of winning! As it has been for the last five years, sponsorship fundraising is being led and co-ordinated by well-known PASALB member Richard ‘Loud’ Leppard and his wife Carol. 2. Direct payment to the PASALB bank account (Details: sort code 77-91-43; Account 80963460) If doing this please use your name and DA as the reference, for example ‘Mark Jones (DA)’. Please make payments by the end of August 2016. Many thanks if you can help, and let me know by email if you have any questions. Here’s hoping for a great season and a memorable one for ‘our’ Derek Adams. Come on you Greens!